The hand-crafted, framed nautical charts accurately depict the actual lighted navigational aids. The small LED lights, driven by a computer programmed microprocessor, indicate the location, color and exact flash sequence of each lighted aid. A personalized light can be added to depict a residence, business, slip or mooring. A decorative masterpiece that only increases in value. 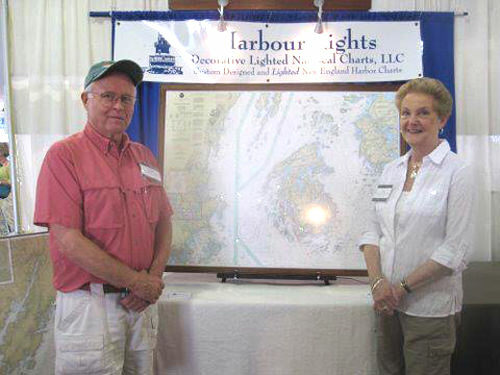 Harbour Lights Decorative Lighted Charts, LLC, located in Connecticut, was founded by Carl Welshman in 2005. In retirement, Carl, a lifelong sailor, wanted to stay connected with the nautical life-style. He had the bright idea that navaids on NOAA Harbor charts could be made to light up and flash in their correct time periods and colors. With the help of his wife Lynn, he designed a system that transforms traditional NOAA charts into living, instructional, decorative conversation pieces. They handcraft nautical charts to their customers' requested specifications. Harbour Lights framed charts make a perfect gift and are finding their way into private homes, offices, yacht clubs, resort hotels and restaurants. Get in touch for further information or to place an order. © 2019 by Harbour Lights Decorative Lighted Charts, LLC.